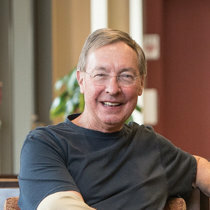 Ted Dintersmith is a leader in innovation, entrepreneurship, and education. With a Ph.D. in engineering and a B.A. in English and Physics, he has become a leading advocate for education policies that foster creativity, innovation, motivation, and purpose. Ted speaks frequently – delivering a vision of what our schools could, and need, to be. Ted’s professional experience includes two decades in venture capital, as well as several years in the government sector. More recently, his interest has turned to education and how to transform our schools to prepare kids for their futures. During the past few years, he has visited all 50 states, meeting with governors, legislators, educators, parents, and students and encouraging communities to work collectively to re-imagine school and its purpose. With co-author Tony Wagner, he wrote Most Likely To Succeed: Preparing Our Kids for the Innovation Era.He funded and executive produced the education documentary Most Likely To Succeed, a film that presents an uplifting view of what’s possible in schools that engage and inspire our students and teachers. His new book, What School Could Be, released in April 2018, shares a vision of school based on the great work being done by teachers across America. 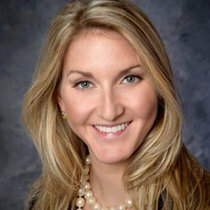 Rebecca Baelen is a doctoral student in Education Policy at the University of Pennsylvania. Her research focuses on developing and testing mindfulness-based interventions for teachers and students. Before starting her doctorate, Rebecca spent five years as a classroom teacher and two years as a research coordinator for Angela Duckworth, where she conducted research on grit, self-control, and mindfulness. She continues to draw upon these experiences to inform her research efforts. Leona is currently a senior attending the Nueva Upper School in San Mateo, CA. Prior to high-school, together with her sister and friends, she co-founded Tribe Awesome, a non-profit that strives to ‘bring out inner awesomeness’. As one of their first projects outside of school activities, Tribe Awesome created an aeroponics system of growing plants that required significantly less water than hydroponics. Leona and her team taught others to make the systems through several ‘Workshop Weekend’ Tech Liminal workshops in Oakland, CA. 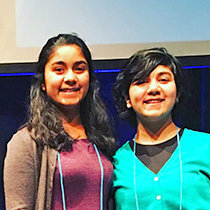 She was introduced to how businesses work in 5th grade, through a project–based learning opportunity at her school that was facilitated by BizWorld.org. Later, BizWorld.org awarded her the ‘2014 Young Entrepreneur of the Year’ award. She is a passionate advocate for using art, literacy, and science to drive social change. At Nueva, she served on the committee dedicated to reforming the school’s disciplinary system through a Judicial Honor Council. During the summer of 2017 she attended the pre-college program at Rhode Island School of Design to expand her repertoire in fine arts. Briana is currently a sophomore attending Brown University in Providence, RI, where she hopes to pursue an independent concentration focused on utilizing behavioral and neurological sciences and psychology to create designs and products that drive positive change. In addition, she is an active member of Better World by Design, a student-run conference at Brown and RISD, and reproductive health through Brown’s Sexual Health Awareness Group. She graduated from the Nueva Upper School in 2017 as the Student Council Lead in the school’s founding class. She was also a co-founder of Tribe Awesome, together with her sister Leona Das and two other friends. Along with her sister, Briana was involved in creating Tribe Awesome’s aeroponics system of growing plants, and teaching others to make the system through ‘Workshop Weekend’ Tech Liminal workshops. In high-school, Briana continued to experience project based learning opportunities, augmented by an immersive design-thinking approach. As a part of her personal project based ‘Quest’ , she designed a wearable application for stress management called ‘Sol’. She is a Student Coach at Nueva Design Thinking Institute and teaches ‘Visual Thinking’ classes to educators and graduate students at the Stanford d.school. Briana is also an alum of the BizWorld program, which introduced her to business and leadership in her middle school, North Star Academy in Redwood City, CA. 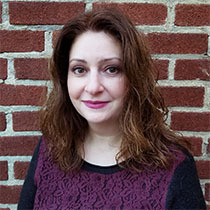 Dr. Gina Ulrich has been an educator in Edison, New Jersey for 22 years with experience teaching general education, special education, and English as a Second Language. Gina received her Doctoral Degree in Education from Madison University. Gina has been honored as her school’s Teacher of the Year, BizWorld’s Educator of Year and as NJ Magic 98.3’s Teacher Who Makes Magic. Gina lives with her amazing, entrepreneurial husband, Brian, and her daughter Samantha, who is also an aspiring young entrepreneur. Outside the classroom, Gina is involved with her daughter’s Girls Scouts organization, as well as the local animal shelter.